Tips on how to stay sane and organized in the event of unfavorable weather on your big day. Picture your top five wedding nightmares: is rain on your outdoor ceremony amongst them? If so, you’re not alone. Many brides- and grooms-to-be note this weather occurrence as one of their greatest fears. However, before you start panicking, take a deep breath and evaluate your situation. Whether you live in an area notorious for spontaneous rainfall or you’re hosting your nuptials during a colder month, you likely have a decent idea of what they weather will be like in your wedding location around your selected date. No matter if you’re six months out and you’re trying to be prepared or you’re a week away and the forecast is giving you anxiety, we have some tips to help you make it through. - Be prepared. It seems like an obvious solution, and that is only because it’s so important. If you’ve given yourself enough time to anticipate bad weather, it’s your job to consider all of your options, whether that be to put up a tent, move to a more-covered area, or switch your celebration to be exclusively indoors. That being said, even if you’ve elected to be inside, think about the transition from car to venue, not only for you and the bridal party, but for your guests as well. Work with your venue and review your options: maybe they can allow guests to drive up further to avoid stepping in mud or provide ushers to stand by with umbrellas. Chances are, your venue has had to deal with rainy weddings in the past, and they might just have the perfect solutions. - Always have a multifaceted “Plan B.” Don’t go into your wedding weekend without a few exit strategies. Even if you’re relatively sure the sun will stay out for the duration of the festivities, it never hurts to have a backup plan. Figure out the best course of action when it comes to making the transfer – Will it be easier to transport chairs and décor inside? Or perhaps you have a new set-up waiting in the wings? This is another aspect that should be discussed with your venue beforehand. - Keep communication open with your vendors. 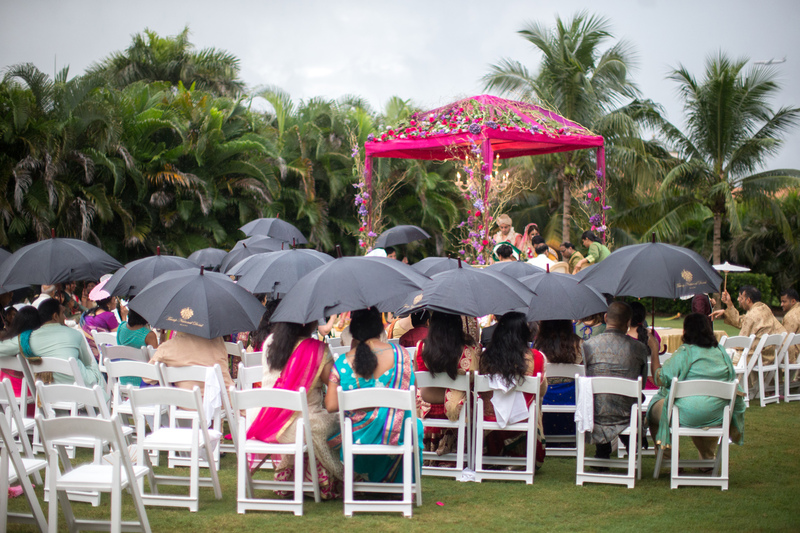 Just like your venue, your other vendors have likely encountered rain during their events before. Make sure they’re all aware of the possibility and ask what precautions they typically take to avoid any mishaps, and take their advice into consideration. It’s important to ensure you’re on the same page when it comes to your backup plan, as they’ll be doing all of the legwork on the day itself. Trust them and their opinions – they’re professionals! - Always err on the side of caution. If the clouds are looking hefty and ominous in the morning, even if the forecast hasn’t been consistent, it’s important that you think ahead: better safe than sorry! Don’t ignore that tiny inkling you’re harboring in the back of your mind – trust your instincts, even if people are telling you not to think about it. Remember that your safety and comfort, not to mention the safety and comfort of your nearest and dearest, comes first. Just because it’s your wedding day, it doesn’t mean you can adopt a devil-may-care attitude toward your guests – don’t make your closest friends and family stand or sit in the rain, umbrellas or not. - Be decisive. Don’t be afraid to make a judgment call. Decide on a time well before the ceremony by which you need to decide whether it’s safe to proceed as planned or to implement “Plan B.” Don’t take too much time to mull over your options – you should already have done that. Once you make your decision, there’s no going back. If the backup plan is already in motion and the rain starts to let up, keep moving forward. Muddling the already-complicated plans by trying to reverse them will only cause confusion and more anxiety. - Remember the positives. There are so many wonderful things about experiencing rain on your big day. For one, it’s considered to be a good-luck sign for the future of your marriage, so take it as an omen of lovely things to come, and for another, cloudy and rainy days make for excellent lighting for your professional pictures. Additionally, think of the amazing couple shots that just became available! It’s understandable if you’ll be avoiding the rain altogether, what with the money and time that went into your ensemble, but if you’re a bold pair, pictures of brides and grooms in the rain are absolutely stunning – you can even wait until the very end of the night to have some taken. See how to include your family in the planning process, get ideas on what guests can toss during your grand exit, and read up on five ways to incorporate coffee into your nuptials.